Out of the major car rental companies in South Africa, First Car Rental is the only which is home grown. It has over 6000 vehicles in its fleet in 45 car hire branches nationwide. It also has in international presence in more than 100 countries in 4500 different locations. Or ask one of our car hire consultants for the best First Car Rental deal! First Car Rental bookings qualify to take part in SouthAfrica.TO's exclusive travel vouchers for reviews program. Simply email a writeup to firstcarrental@southafrica.to and we'll send you a voucher. Tip: longer writeups with more photos earn bigger vouchers. News: Sep 2107 - First Car Rental have launched their NNAWT (Now or Never African Wildlife Trust, which focuses on saving rhinos and elephants which have survived poaching attempts. 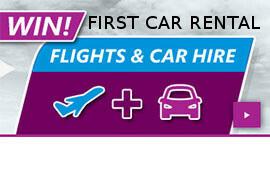 Click here to view the current First Car Rental competitions. Dec 2016 FCR; together with FlySafair and Anytime Holidays are running a competition where you could win a 3 night midweek stay at Inverness Luxury Resort in Cape Town; including flights and group C car hire from CPT. In Oct 2015 First Car Rental and Flysafair were giving away two return flights AND car hire for three days, valued at around R4500. The winner could choose any Flysafair destination in South Africa and Group C car hire in their chosen destination. 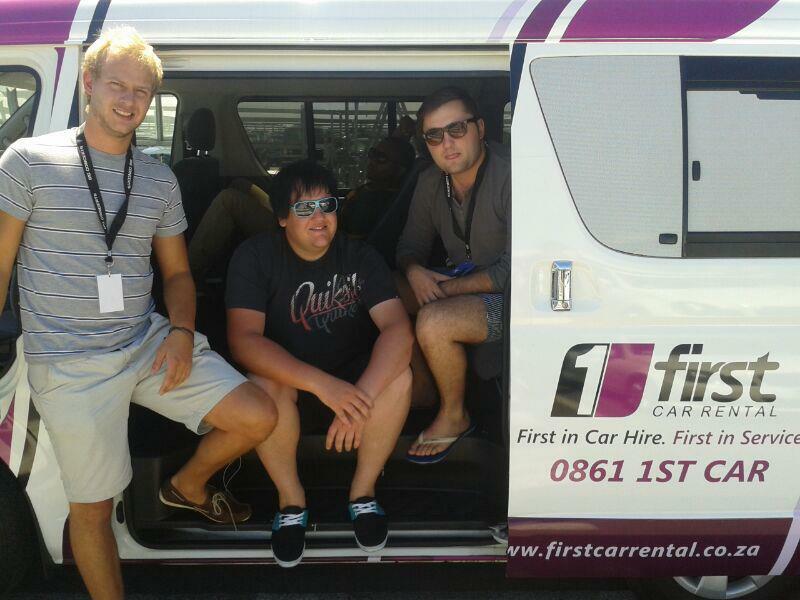 November 2014 : First Car Rental are the official car hire agency of new airline, FlySafair. They are running a competition together, where you could win car hire for 2 as well as return flights. Click here to enter, and answer the question: "When will FlySafair start flying between Johannesburg and Port Elizabeth?" 2014-03-04 First Car Rental has started up its charity campaign to support SA’s The Rhino Orphanage. To win, participants are requested to find one of the First Car Rental Nissan Jukes that have been branded to look like a Rhino mother and child, post a selfie with the car (get a clear shot of both you as well as the car) then post the selfie to twitter or Google plus with the hash tag #Rhinos1st. Prizes include one of 2 holidays worth R20 000 and will be awarded for the most creative selfie as well as a lucky-draw selfie prize. Competition ends at 5pm on 18 November 2014. The Rhino Orphanage takes special care of baby rhinos that have been left motherless by poachers. This is the first non-profit organization offering rehabilitation for hurt and orphaned baby rhinos. This competition ends in November 2014. It is really smart of FCR to make the connection between their vehicles and rhinos in an innovative way. This can only be of benefit to both those wonderful beasts and the motor vehicle company. 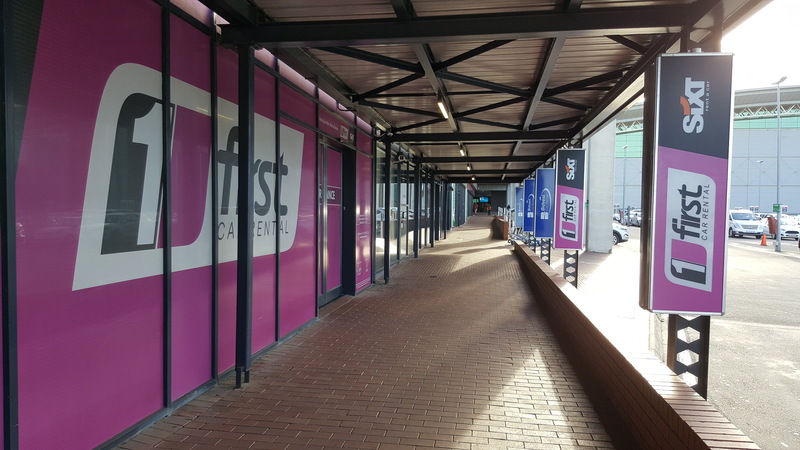 First Car Rental's branches at Bloemfontein, Upington and OR Tambo have been named the Best Medium Car Rental Operator by ACSA (Feather Awards). 16 October 2015: First Car Rental and Sabre Corporation have joined together, in a multi-year global distribution contract that will allow over 425 000 Travel Agents access to this acclaimed Car Rental Agency’s first class services. Sabre Corporation is one of the prime technology providers to the worldwide travel industry, and now all new content from First Car Rental will be accessible in Sabre. Sabre Corporation’s travel marketplace aids in the marketing and sales of all types of travel – flights, hotel accommodation, rental cars, train tickets and others. Over 425 000 Agents and thousands of other companies use Sabre to manage their travel; it is one of the world’s biggest marketplaces of its kind, dealing with an estimated $110 billion in travel spending. First Car Rental will be bringing its award-winning rates and services to the fingertips of Sabre clients, adding to the already extensive range of services that can be found via Sabre. Richard Addey, the Country Director of Sabre South Africa said, "South Africa is an important growth market for Sabre and we are pleased to now offer First Car Rental to our growing agency base. Our agency customers want a wide range of global and local content to meet their travellers' needs, and that's what we set out to provide. First Car Rental also shares our appetite for innovation and new capabilities that enhance the traveller experience, so it's exciting to be working with them." Melissa Storey, the Executive Head of Strategy, Development and Marketing at First Car Rental is equally as thrilled. She says, "We are excited to announce our global distribution agreement with Sabre, which gives us immediate access to their global subscriber base of travel agents and thousands of corporate travel departments.The agreement forms part of First Car Rental's continued commitment to deliver first-class service to all our stakeholders in the evolving travel industry." New Procedures for Invoices and Refunds: From October 2015, First Car Rental will instantly issue rental invoices on the termination of a rental. In addition, credit card refunds and authorisation releases will process within 48 hours after rental termination instead of the usual 7 working days (these new procedures are applicable provided there is no damage caused to the vehicle or e-toll transactions needing to be processed from SANRAL). Bloemfontein Downtown New Location: The new location can be found at the 4 star President Hotel, 1 Union Avenue, Bloemfontein. This branch was formerly at Dynamic Truck Rental, 9 De Bloem Avenue, Bloemfontein. First Car Rental is awarded Top 500 Status for the 7th Year Running – October 2015: The Top 500: South Africa’s Best Managed Companies is the authority on what makes a business great, recognising the best leaders of South African industry. These companies are recognised not only for excelling in their specific fields, but for the policies they have in place – policies that promote empowerment and development, socio-economically and professionally. First Car Rental has been recognised as a Top 500 Best Managed Company for the seventh year in a row, a fantastic achievement. 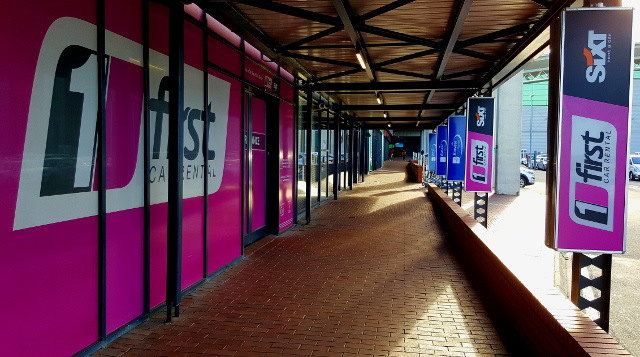 22 April 2015: Combined Motor Holdings, the owners of First Car Rental, have announced their financial results to 28 Feb 2015. There was a 1.8% increase in average daily rental rates, and a 3.5% improvement in rental days sold. The average fleet life has been increased from 12.5 months to 15 months; and CMH say they have a similar selling price. Interestingly enough, a division renting older cars will be marketed under the brand name "Restart" - this will be to corporates wanting to hire from more than 90 days. FCR is launching a van & truck rental division. To those hiring their vehicles, First Car Rental offer a white label app of Tourism Radio's, which is a travel guide for visitors to South Africa. First Car Rental used cars (or pre-owned as some prefer to call them) are sold through Car Cart, who they have partnered with. Once their vehicles have done from 45,000 to 55,000 kilometres or are 9 months to 2 years old; they put them up for sale. The vehicles all have been serviced regularly and their full service histories are available. Click here to see the latest deals. "Life is tough in the fast lane. Frequent flyers experience frequent delays and queues every day. But not at First Car Rental. Our Show & Go Mobile Checkout card allows frequent travelers to be checked out and leave in their hire car in less than a minute. No branch, no queue, just show and go. To apply sms 'first' to 35635. First Car Rental. First in car hire. First in service.'" I would like to rent a vehicle from Durban Airport - 14 to 16 August 2015. How much is the cheapest vehicle? How about a Chevrolet Spark or similar at R594* for the weekend? See First Car Rental deals for a full list of prices we've quoted. By getting an idea of what specials there have been in the past, you can get a feel for today's prices. *Note that prices may have changed since the above quote was done. In September 2013 First Car Rental opened a new branch in Rustenburg (firstrustenburg@cmh.co.za, 014-523-6060). Also in September 2013, First Car Rental Bellville moved to 200 Durban Road, Oakdale, Bellville. We have made a lot of use of First Car Rental's services over the years, because of the value for money they offer. Chev Spark 0.8 L Man. Ford Figo 1.4 L Man. Nissan Tiida 1.6 L Man. Saw a car you want to hire? Ask for a quote or pop a question to one of our consultants here. Web-Link is used for electronic bookings. Web-Link is an online interface with First Car Rental's rental operating system. First Car Rental offers a 24 hour roadside assistance service. Should your car keys be locked inside the car, there is a lockout service. Should you run out of fuel, there is an emergency fuel delivery service (cost of fuel is for the renter's account). There is a message relay service, which will relay a message to a family member (phone 0860-888-911 if you require service). Hotel Express Discount - If you are a Hotel Express member, you can make use of discounted rates if you book a car with First Car Rental. Show and Go Loyalty Card - Designed for corporate customers. When you get off the plane, you can walk straight to the Show and Go area and pick-up a vehicle wihout any paperwork. These check-out facilities are available at O.R. Tambo Int. Cape Town Int. and King Shaka Durban Int. M Voges, C Webber, K Werth, U Wessels. Thebe Tourism Group has a 50:50 operating joint venture with First Car Rental. 2011-04-30: Rating 5/5: We rented a car from First Car Rental in Nelspruit for the first time, and they even phoned us up to remind us we had forgotten a driver's license. 2009-08-01: Rating 5/5: First Car Rental Johannesburg review - first class service. 2009-07-24: Rating 4/5: Once again the Johannesburg First Car Rental offered the best prices and we got great service (thanks Kaizer! ), from their new offices on the 2nd floor. 2009-05-04: Rating 5/5 Review of a First Car Rental from Johannesburg Airport. 2009-04-24: Rating 5/5: First Car Rental's service at Johannesburg O.R. Tambo was top drawer - they not only saw us to our car, but also packed our bags into the car (thanks William!) We had fun driving the Mazda 3 from Joburg to Nelspruit. April 2015 : Happy 16th Birthday to First Car Rental; which was launched in 1999 under the National Alamo brand, which was subsequently changed to First Car Rental in 2008. 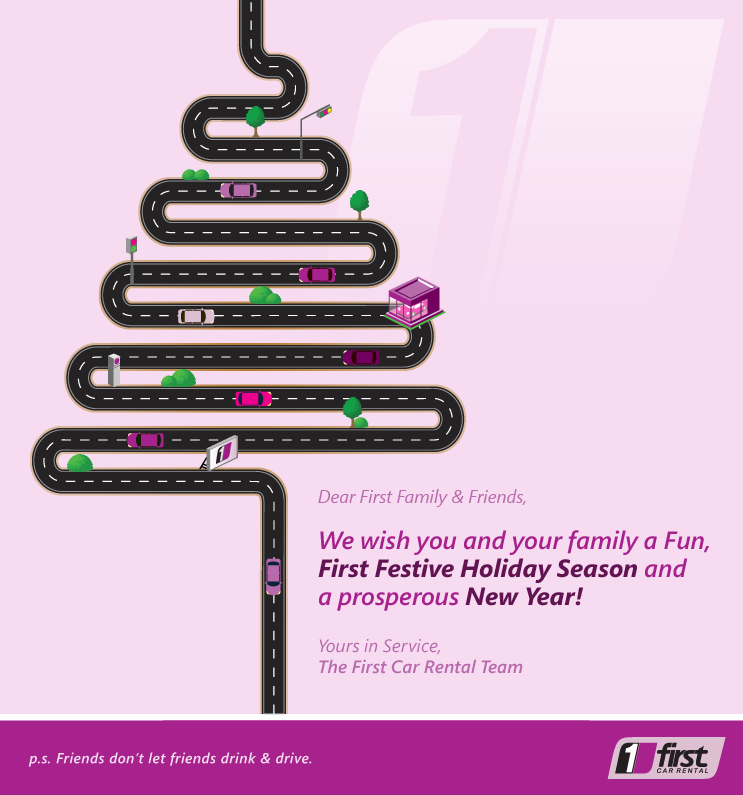 2014-12 : Festive Season greetings. 2014-04-18 First Car wins the Most Consistent Performer over the Past Three Years award at the South African Service Awards. 2014-03-21 News just in: First Car Rental has made the top 500 best managed companies of 2013-2014! This coveted prize is awarded by TopCo Media’s team of research experts who dig out the gold from the dust, with the most impressive five out of one hundred different industry sectors receiving the award. This is the fourth year in a row that First have achieved this admirable feat. 2014-03-13 Car hire bookings via your iPhone, what’s next?! Smart phone users, get your thumbs ready! It's just about to get easier to book your rental car! First Car rental has a new mobile phone application. Their app will be up and running as from April 2014, allowing customers to book a rental car and view all included fees on their smartphones. The android version is to follow shortly. 2014-01-16 First Car Rental have announced their 10 favourite SA heritage sites. They've been very diplomatic, finding something in almost every province - Castle of Good Hope (Cape Town) Cradle of Humankind (Gauteng), iSimangaliso Wetland Park (KZN), Mapungubwe Cultural Landscape (Limpopo), Nelson Mandela Museum (Eastern Cape), Pilgrim's Rest (Mpumalanga), Richtersveld Cultural & Botanical Landscape (in the Northern Cape Province) Robben Island (Cape Town), uKhahlamba-Drakensberg Park (KZN) and redefort Dome (Free State). December 2013 First Car Rental has added new stock to their fleet and released up to 7 cars reduced to sell. 2013-10-15 CMH reports its results for the 6 months to 31 August 2013: First Car Rental's operating margin increased from 7.3% to 9.3% as a result of higher fleet utilisation and an increase in the average daily rate. They opened 4 new branches. 2013-10-15 CMH, First Car Rental's holding company, has appointed JTM Edwards to replace Maldwyn Zimmerman as Chairman. Zimmerman had been Chairman since the inception of the group in 1976. 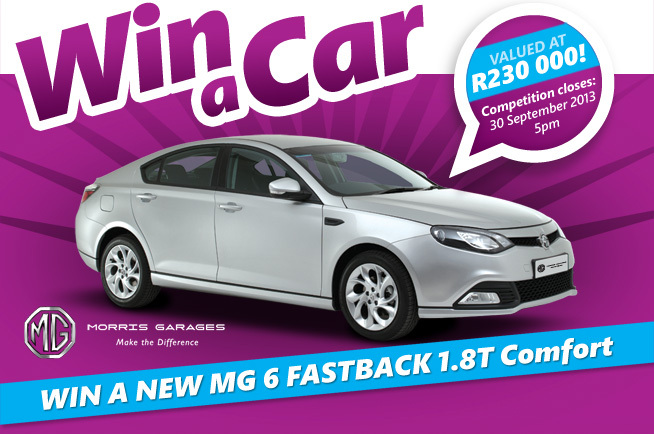 2013-09-30: If you book a Group W car with First Car Rental before the 30th September you stand a chance to win an MG6. “We are very proud at winning this award as we were up against all our competitors this year. It is one of the awards we aspire to the most because all companies are rated by their actual customers, therefore providing a completely unbiased view as to the level of service that the company is providing, and it doesn’t depend on size or volume.” said First Car Rental's Executive Head: Strategy, Development & Marketing, Melissa Storey. 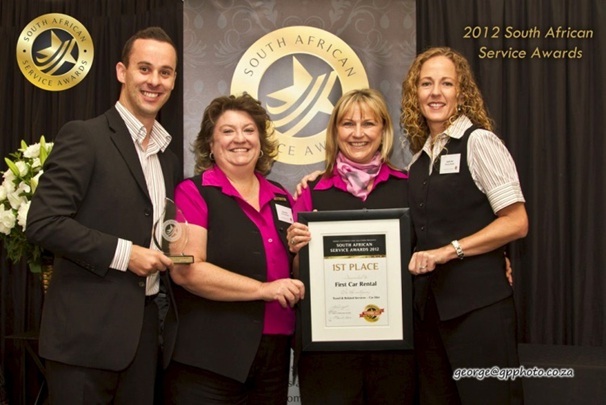 2013-03: First Car Rental is selected as one of the top 500 best managed companies in South Africa. "Qualifying as a Top 500 Best Managed Company again represents a gilt-edged achievement for First Car Rental. It is wonderful for all our staff to get the recognition from Top 500. First Car Rental is performing at optimum levels so expect us to keep climbing the ranks.” says First Car Rental's Executive Head: Strategy, Development & Marketing, Melissa Storey. 2013-02: Newton's 2nd law fronts for Rodriguez in his tour of South Africa, and are transported in First Car Rental's Purple Power vehicle. 2013-02-20: First Car Rental introduces four new models to its rental vehicle fleet. The new vehicles are the Ford Focus 1.6 L; the 2013 SUV Nissan Qashqai; the 2013 Isuzu KB72 double-cab bakkie; and the 2013 BMW 320i F30 twin turbo. These new vehicles are available at First Car Rental branches at OR Tambo, King Shaka and Cape Town international airports. 2012-10-22: A Nissan Tiida is donated to the Children of Fire Trust in Joburg (Melville). "When fires occur in squatter camps, Children of Fire staff members are often in desperate need of an additional vehicle to get supplies to the people living there. Disaster mitigation is part of their mission and they distribute red disaster recovery bags with survival basics to last a few days. Having a car will help them reach these families a lot quicker. They also travel around the country on safety outreach programmes, so they will be able to get to a lot more places than before. Working with M-Net Cares to get this car to this Trust was a gratifying and humbling experience and one that I will never forget." said Melissa Storey from First Car Rental. "Children of Fire would like to sincerely thank First Car Rental for the Nissan Tiida. The nature of what we do; working with child burn survivors from across South Africa and beyond, means we spend a lot of time on the road travelling between hospitals and their homes. It can be quite a logistical nightmare...Everyone wanted a chance in the driver's seat. All the children imagining what it would be like to drive; they all want to be race car drivers." said Chilren of Fire's manager, Rosie Chirongoma. 2012-07: First Car Rental opens a new office in Centurion Lifestyle Centre, 800m from the Centurion Gautrain . JOHANNESBURG, POMONA, FRIDAY, 9 MARCH 2012 - First Car Rental wishes to inform all present, past and future customers that Velvet Sky is our airline partner, and that our partnership agreement is the only association we have with Velvet Sky. The low cost airline’s current predicament does not affect First Car Rental or CMH operations and we are carrying on as per usual. We are honouring all First Car Rental bookings made via the Velvet Sky website. Customers are able to amend or cancel bookings by means of the links provided on their voucher confirmation or via our Call Centre. We will also refund prepaid rentals done via the Velvet Sky website due to flight delays and/or cancellations. First Car Rental will not penalise customers for cancellations. Payments will be refunded in full should customers wish to cancel pre-paid reservations since operational issues were announced by the airline on 20 February 2012. We sincerely wish Velvet Sky all the best in their endeavour to resolve their affairs and we continue to remain supportive." 2011-03-20: First Car Rental has joined Good Fellas, a members-only chauffer service which provides an alternative to driving under the influence of alcohol. When you rent a car from First Car Rental & you are already a Good Fellas member, you may make use of the Good Fellas service during your rental period without fear of breaching your terms of contract with First Car Rental. 2010-12: On the 1st of December 2010, First Car Rental opened its Southbroom branch (KwaZulu-Natal). First Car Rental Southbroom can be found at Shop 3, Driftwood Centre, Gilbert Road, Southbroom. The branch manager is Charlene Roets. 2010-11-26: First Car Rental sponsors the Freedom Revolution Unicycle Tour in South Africa, which covers 2500km from Durban to Cape Town. The tour takes place for Bob’s For Good Foundation, run by former Springbok rugby player Bobby Skinstad, the charity provides shoes for disadvantaged children all over South Africa. 2010-10-01: First Car Rental is one of 3 car rental agencies represented at all Gautrain stations. AARTO - to ensure a standard is maintained within the metro's. Ensure effective and speedy vehicle licensing and renewals. Allowing SAFTLA to negotiate with law makers to discuss or suggest changes in legislation where necessary. Ensure removal of traffic fine liability on member's names. To provide legal representation where necessary. 2009-05: First Car Rental teams up with bnbsure.co.za, offering car rentals through their website. 2009-04: First Car Rental moves its offices at Johannesburg O.R. Tambo International Airport. 2008-10-07: Due to fraud, First Car Rental starts requiring a second credit card for Class D and above bookings. 2008-10-07: A First Car Rental Branch is opened and operational in Mthatha. 2008-10-01: First Car Rental is appointed as the Sixt representative for South Africa. 2008-04-01: Cmh Car Hire (Pty) Ltd trading as National Alamo Car Rental is rebranded First Car Rental. This change was necessistated by Europcar's purchase of the "National" and "Alamo" brand names. Jun 2005: In Boksburg, a BEE-owned agency is awarded to Ms Buyi Nkosi. 2004-10: The first awarding of an agency to a BEE partner, Mrs Peggy Scheshe, entitling her to operate a branch in Braamfontein with its own vehicle fleet. 2000-04-01: First Car Rental opens its doors back in 2000 as a national Alamo Car Rental. 1999: Combined Motor Holdings purchased the franchise rights to the National Alamo brand, bringing National Car Rental to South Africa. With humble beginnings,the company kicked off with 3 car hire branches & a fleet of 45 vehicles. 1988: Nippon Car Rental signs an affiliate agreement with National Car Rental. 1947: 24 independent car rental operators get together in Chicago's Drake Hotel and establish National Car Rental, with its head office in Missouri, USA.